Charfoos & Christensen’s attorneys are compassionate and we take the time to listen and answer your questions. We are dedicated to protecting injured victims and their families. We are one of the oldest and well regarded plaintiffs’ law firms in Michigan. David Christensen, a shareholder of Charfoos & Christensen, P.C., is one of the most respected litigators in Michigan. He has been practicing law for over 40 years and has tried over 100 personal injury jury cases to conclusion in areas of automobile negligence, premise liability, products liability and medical malpractice. Christensen obtained verdict records in Michigan and South Dakota. In addition to handling several cases which involved children who were victims of improper obstetrical deliveries, Christensen was one of the lead attorneys in the historic case against the Christian Science Church. He litigated one of the early “Pinto” cases against the Ford Motor Company. In the year 2000, he obtained a verdict against General Motors Corporation in a claim alleging a defect in the seatbelt in that the seatbelt released during accident conditions. This verdict was ranked 5th highest in the State of Michigan for jury verdicts reported in the Michigan Lawyers Weekly that year. It is also the only appellate sustained verdict against General Motors Corporation alleging inertial release defects in their seatbelts. He obtained another leading verdict in 2013 against a number of construction companies for failing to safeguard a construction site in Detroit; leading to the drowning death of a Detroit man who had jumped into deep water to save a child in trouble. Christensen’s outstanding advocacy skills have not gone unrecognized by his peers. In 2001 he received the Distinguished Alumni Award from Michigan State University- Detroit College of Law, and the Michigan Chapter of the American Board of Trial Advocates (ABOTA) named him Trial Lawyer of the Year in 2003. He has been listed in The Best Lawyers in America, since 1987. In 1998 the Oakland Bar, Adams Pratt Foundation presented him the Sanford Rosenthal Memorial Award. The Respected Advocate Award was presented to David by the Michigan Defense Trial counsel in 1991. The American Board of Trial Advocates presented him the Richard D. Baxter Trial Lawyer of Year award in 2003. 2014 David was honored with the “Top 1% Litigator” award. For over 10 years, David has been recognized as a Michigan “Super Lawyer”; he also received the “Champion of Justice” award. Christensen is a member of a number of professional organizations, including The International Academy of Trial Lawyers, The American College of Trial Lawyers, The American Board of Trial Advocates, Detroit Bar Association, Michigan Trial Lawyers Association, Wolverine Bar Association, Michigan Association For Justice and Association of Trial Lawyers of America. A graduate of Wayne State University in political science, Christensen earned his juris doctorate from Detroit College of Law in 1973. While in law school he was a teacher in the Detroit Public Schools. Subsequently, he joined the Charfoos firm. Christensen is co-author of the groundbreaking volume, Personal Injury Practice: Technique and Technology and Starting the Case: A Manual of Complaints. His 1998 publication, “The Works” Medical Malpractice Law 1993-1997, was followed with “The Works: Part 2 – Michigan Medical Malpractice Cases Annotated 1998-2003.” Christensen’s articles have been included in a number of professional publications and he is often invited to appear as a guest speaker. In 1995, Christensen was appointed Honorary Danish Consul for the State of Michigan. Her Majesty Queen Margrethe II of Denmark appointed him Knight of the Order of the Dannebrog in 2004. David R. Parker is a shareholder in the firm of Charfoos & Christensen, P.C. He is an appellate specialist who became associated with the firm in 1983. In his present role with the firm, he has primary responsibility for appeals in the Michigan Supreme Court, the Michigan Court of Appeals, the United States Sixth Circuit Court of Appeals and the United States Supreme Court. He also heads the firm’s research department, assists in briefing dispositive motions in trial court and prepares seminar material. Parker’s keen interest in the art of writing briefs and his strong presentational skills have earned him the well deserved respect of the state’s legal community. Mr. Parker assisted in researching, drafting and editing the widely used book Personal Injury Practice: Technique and Technology, which he updates periodically for the publisher. His other works include Starting the Case in the 90’s: A Current Manual of Michigan Complaints; Michigan Medical Malpractice Cases Annotated: 1987-1993; Still Starting the Case-2001: An Updated Collection of Michigan Complaints; The Works: Medical Malpractice 1993-1997, and The Works Part II: Medical Malpractice Cases 1998-2003; and chapters involving legal and medical malpractice in ICLE’s Damages: Michigan Law and Practice and Torts: Michigan law and Practice. Mr. Parker is a member of a number of professional organizations. He was recognized in dBusiness Magazine as “Top Lawyer” and awarded “Super Lawyer” in 2010-2015. Mr. Parker is an active member of the Michigan Association for Justice and often invited to be a guest speaker. Mary Pat Rosen has been associated with the Charfoos & Christensen Law Firm since January 1988. Ms. Rosen has chosen to concentrate her practice in areas of medical malpractice, automobile negligence and other personal injury areas. Her drive has come from a heartfelt obligation to help right a wrong. During her time with Charfoos & Christensen, Ms. Rosen has participated in resolving several million dollar cases. She along with David Christensen, David Parker and paraprofessionals provided a unique team effort in assisting clients through the litigation process. While earning her law degree, she worked with the Michigan Department of Labors’ Commission for Handicapper Concerns and for the Commission for the Blind. Early in her legal career she was highlighted as a Michigan Trial Lawyer Association (now Michigan Association for Justice) Pacesetter. Ms. Rosen is AV rated by Martindale- Hubbell, the highest professional rating. Ms. Rosen is a member of a number of professional organizations. She was recognized in dBusiness Magazine as “Top Lawyer” and designated a Super Lawyer. She was an executive board member of the MAJ, Matrix Human Services, and Trustee for the National Fragile X Foundation. Ms. Rosen is elected to the Cranbrook Kingswoods Board of Governors (chaired the schools’ Development Committee); is Vice President of Impact 100 – Oakland County, a non-profit organization benefiting the residents of Oakland county; a member of the Cranbrook Horizons Upwards Bound Development Committee; coaches the Cranbrook Boys Middle School cross country and track teams; is a member of The Inns of Court with The University of Detroit Law School; and an avid photographer. CHARFOOS & CHRISTENSEN, P.C.’S non-lawyer support staff brings a variety of experience, education and expertise to the firm to assist attorneys in the litigation process of our clients’ cases. 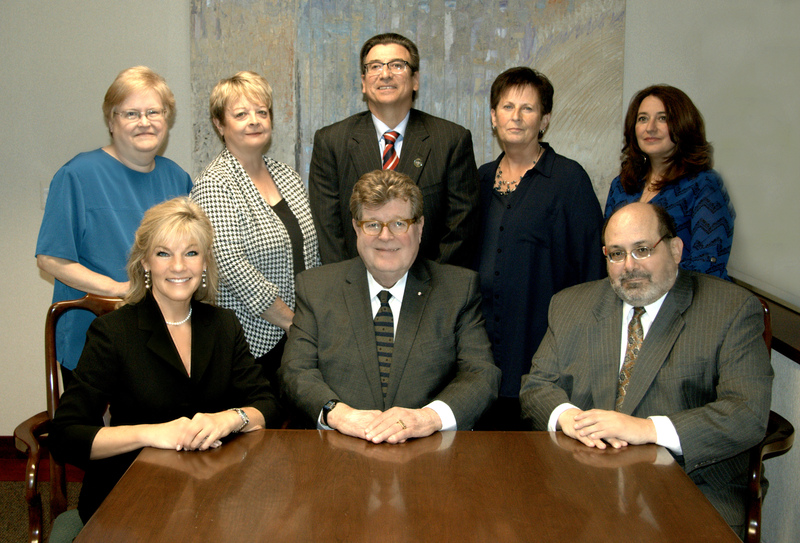 Our staff has developed relations with court personnel and other legal professionals that help them get the job done. We promise to keep you informed as your case proceeds, and answer any questions you have. “Of counsel” Attorneys are lawyers outside the firm who provide expertise in a particular specialty and are available to discuss cases. Mr. Ghannam provides a wide range of legal and advisory services. He represents U.S. government contractors, startups, and established tech firms in business formation, new business development, due diligence, contracts, and operations needs including employment law. He also represents clients in personal injury and negligence matters. With years of top-tier media experience, he is available to serve clients in media law as well as media risk mitigation and strategic outreach. A thought leader on digital media, he has presented on his research at Google’s Internet at Liberty, on expert panels at The National Press Club in Washington, D.C. and in op-eds in The Washington Post and The Economist debates. He covered the law as a staff writer and editor at the Detroit Free Press and at the American Bar Association Journal. He has also worked internationally in 10 countries and supported the Bill and Melinda Gates Foundation in the formation of the $2.5 billion Lives and Livelihoods Fund. In addition to Michigan, he is licensed in Washington, D.C. and has a vast network of professional resources in the nation’s capital and in Santa Monica, California, better known as Silicon Beach, to serve business clients seeking venture capital and the next stages of growth. Thaddeus “Ted” Kedzierski focuses his practice on Taxation, Real Estate, and Business Law. In addition to being a certified public Accountant (CPA) and tax attorney, Mr. Kedzierski is certified in financial forensics (CFF) credential by the American Institute of Certified Public Accountants (AICPA). Richard Lenter has been a trial attorney from 1970 to present. In the early years of practice attorney Lenter tried everything, including misdemeanors, felonies, divorce, personal injury, commercial, wrongful discharge, discrimination and class actions. The practice gradually evolved into a concentration in medical malpractice (plaintiffs’). Attorney Lenter has briefed and argued cases in the Michigan Court of Appeals, Michigan Supreme Court, Circuit Court, Federal District Courts, and Sixth Circuit Court of Appeals. John David Simpson has broad and diverse legal experience which includes corporate, general business, entertainment transactions, as well as civil and criminal litigation. Attorney Simpson has almost 10 years of judicial and quasi-judicial experience. In 2008 Simpson was appointed as the first African American male Magistrate of the 46th District Court in Oakland County. Over the years Attorney Simpson has been able to leverage his broad based legal expertise and business acumen to become a successful entrepreneur creating business ventures in entertainment, the restaurant and bar industry, and consulting. He has served as General Counsel to several small businesses.